Over 200 people who could read and write, including one guest who learnt to read at 25, attended and supported a charity ball at the May Fair Hotel on Monday 2nd June. Over £170,000 was raised in total in aid of Beanstalk, an exceptional children’s literacy charity. The event was sponsored by wealth management firm Vestra Wealth LLP, without whose personal support the event could not have taken place. 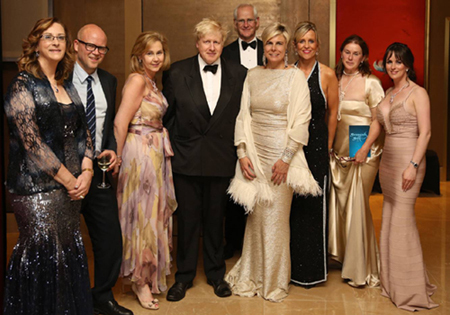 Speakers included HRH Princess Laurentien of the Netherlands, UNESCO’s Special Envoy on Literacy for Development, Boris Johnson, Mayor of London and the charity’s ambassador and author Paul Connolly. Beanstalk is also extremely fortunate to have as their patron, The Duchess of Cornwall. As a mother and grandmother, she is extremely familiar with the energy and expertise that Beanstalk generates to help tackle illiteracy in the classroom. The ball, a first for the charity, aims to continue raising money for its work in supporting children who struggle to read. Last year Beanstalk’s worked with 7,350 children across England in over 1,100 schools through the help of over 2,300 reading helpers. The charity aims to help 18,000 children struggling with their reading by 2018 and urgently needs more volunteers. Following a champagne reception, guests enjoyed a delicious dinner with a whirlwind of magical entertainment, under the aegis of Toby Young, founder of the West London Free School and Master of Ceremonies. As ever, Lord Archer was a superb auctioneer and spun his own magic to elicit some fantastic bids! Guest of honour HRH Princess Laurentien of the Netherlands called upon Mayor Boris Johnson to team up “on a European bicycle tour” with Beanstalk and herself as the founder of the Reading and Writing Foundation to expand the success of the ‘Get London Reading’ campaign across other European countries. Boris Johnson responded very positively to the invitation of the Princess, embracing her wish to raise awareness on literacy. Boris shared a personal anecdote of being left behind in the reading stakes when, at the age of six, he was told that his younger sister Rachel was a better reader. With typical insouciance, Boris blamed the reading material (Peter and Jane) and revealed it was ‘The Cat in the Hat’ that inspired his love of reading. In an emotional concluding speech, Paul Connolly, who suffered abuse in an East London children’s home and who only learnt to read at the age of 25, urged guests to support Beanstalk in their efforts to give children the opportunities that his peers tragically missed out on.